Hi everyone! 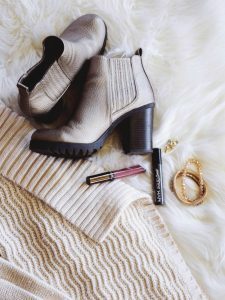 I’m collaborating with four of my favorite beauty/lifestyle bloggers to bring you our favorite fall fashion staples this season. 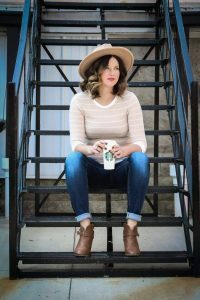 Best of all, most of my outfit is super affordable – the majority is from Target or I found it at a huge sale price. If you’re looking to scoop up a few new fall/winter items, then this post is right up your alley. Since this is my first fall/winter back in the northeast, I have to re-acclimate myself to what clothing items are really practical. For example, peep toe perforated booties that I loved in Houston won’t work so well when it’s 40 degrees in New Jersey. My Hunter rain boots are certainly welcome in the northeast, but I do need to now invest in the coordinating warmer socks to keep my tootsies warm, as well as, investing in a good pair of snow boots (of course, they’ll be gold glitter because AMAZING). I also need some texting gloves, because, essentials. So now that we got the investment pieces out-of-the-way, let’s talk AFFORDABLE. Like I mentioned, a lot of my outfit is straight from Target because their fall/winter selection is AWESOME this year. Highly recommend checking out all of their cute dresses, shoes (as always), t-shirts and jackets. My black floral bell sleeve dress is from Target, as well as, the faux leather jacket which feels super nice and doesn’t have that fake, shiny faux leather look at all. I plan on picking up a few other similar style dresses soon and can’t wait to pair this jacket with basically everything in my closet especially since I live in t-shirts and jeans – add a cute scarf for when it gets a little chillier out for added warmth. The blush pink bucket bag has adjustable straps so you can wear it on your shoulder or cross body and is $23! Also comes in black or gray. Not AS affordable are my accessories (sorry). I’m a HUGE Kendra Scott fan and love the new styles she’s launched this season. The Shiloh Hoop Earrings in Gold* are just delicate yet edgy enough for me, and the Supak Beaded Bracelet Set In Black Spinel* goes perfectly with my black FitBit to add a little style to the bulky fitness piece. Kendra Scott jewelry wears so well, never has tarnished on me and looks beautiful with casual looks or for fancier occasions. Totally worth the price and I highly recommend. If you’re wondering where my long hair came from, that’s compliments of my Luxy Hair extensions I always wear to feel a little extra fabulous! Get a little $$$ off a set of your own if you purchase through my affiliate link and use code BRIGHTERDARLING5 at checkout. What fall fashion staples do you recommend I pick up now that I’m back in the northeast? What do you get the most wear out of during the fall/winter? Let me know in the comments! "Split Face Wear Test FENTY vs TOO FACED Peach Perfect [YouTube]"